Please take a moment to review the scanned copy of a letter received from Domain Registry of America* (DROA). Many of the users registering domains via DNS Central have received these letters and in at least a few instances, the recipients were duped into thinking that this was the "official" renewal notice for their domain. 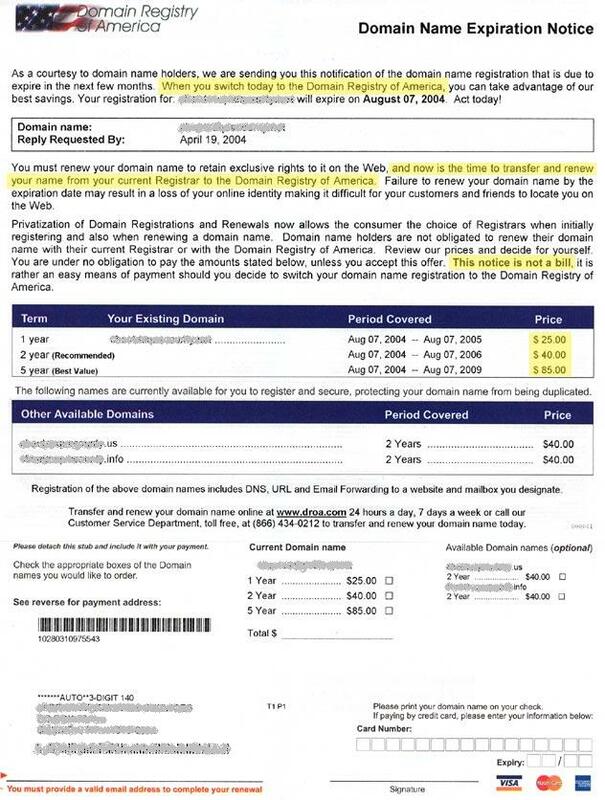 If your domain is registered with our service, or with another service other than DROA, and you receive this letter - please disregard and discard the letter. DROA has been using this deceptive tactic for several years now, causing many people to inadvertently transfer their domain to the DROA service, sometimes having to pay a higher annual fee per domain for the transfer. Take a moment to read the letter carefully and examine the sections highlighted in yellow - you will see that the notice is an offer to switch registrars and not an official renewal notice. (para. 1, 2 & 3). When it concerns something as important as your domain name, please read carefully anything that is mailed or emailed to you. If your domain is registered through DNS Central, you will not receive a postal mailing regarding the renewal of your domain. All of our renewal notices are sent via email, and from our customer service email address, and our company website address is clearly displayed on the notice. On December 23, 2003 the Federal Trade Commission requested that a federal district court enjoin Domain Registry of America, Inc., from making misrepresentations in the marketing of its domain name registration services and require it to pay redress to consumers. "Court Bars Canadian Company from Misleading Consumers in Marketing of Internet Domain Name Services. Stipulated Order Requires Payment of Consumer Redress, Prohibits Future Deceptive Conduct"
You are advised to file a mail fraud complaint with the United States Postal Inspection Service at http://www.usps.com/ and decline any and all registrar transfer notices you may receive. In addition to the Postal Service, the FTC works for the consumer to prevent fraudulent, deceptive, and unfair business practices in the marketplace and to provide information to help consumers spot, stop, and avoid them. To file a complaint, or to get free information on any of 150 consumer topics, call toll-free, 1-877-FTC-HELP (1-877-382-4357), or use the complaint form at http://www.ftc.gov. The FTC enters Internet, telemarketing, and other fraud-related complaints into Consumer Sentinel, a secure, online database available to hundreds of civil and criminal law enforcement agencies worldwide. Note: On December 23, 2003, A court order was issued by the United States District Court on behalf of the FTC prohibiting Domain Registry of America from engaging in similar conduct in the future, and is subject to stringent monitoring by the Commission to ensure its compliance with the court order. It is very important that you contact the FTC to notify them about the ongoing activity in violation of the court order. If you have questions or concerns about your domain name renewal or registration, please call or email DNS Central -- we are here to help you! Please note that Domain Registry of America also operates under the following names and most likely many more.